If you know how to use PowerPoint® then you can create kiosks, menu boards and digital signage TV displays with PowerPlayer™. 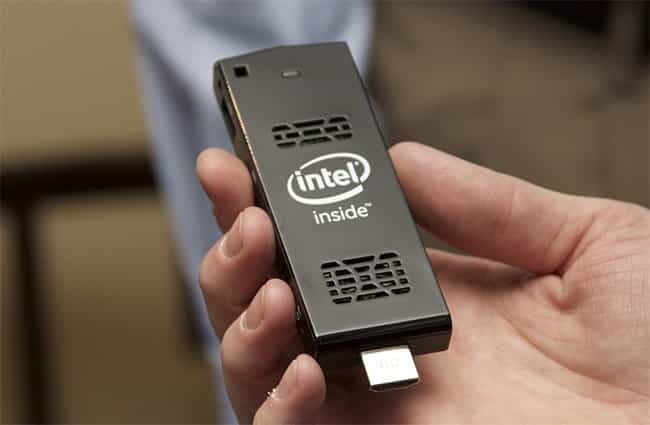 Simply plug it into your TV’s HDMI to display any PowerPoint presentation. What could be easier? PowerPoint has a wealth of features, from design templates to drag-and-drop screen layout, that make it easy to create professional digital signage customer presentations. PowerPlayer is a Windows 10 mini PC stick. It’s an innovative digital signage player that transforms your TV into a multimedia digital sign with PowerPoint. Digital signage gives your business a competitive edge and powerful marketing tool to drive sales. Create high impact in-store multimedia TV signage to promote your products and services. Digital signage TV displays are ideal for lobbies, meeting rooms, hospitality, schools, health care, retail stores, food outlets and shopping malls. Use them where you have customer foot traffic. PowerPlayer is a complete PowerPoint digital signage solution. We provide a Windows 10 PC stick media player and cloud-based content management–everything needed to upload, schedule and display PowerPoint digital signage on your TV. All you need is PowerPoint. There’s no complicated software to learn. Create kiosks, menu boards and digital signage presentations with PowerPoint templates and simple drag-and-drop screen layout. PowerPlayer is a pocket-sized Windows 10 mini PC stick. It’s PowerPoint TV plug-and-display ready. Simply plug our digital signage player into your TV’s HDMI source input to display PowerPoint presentations. We include PowerSignage™, our cloud-based content management service (CMS) for PowerPlayer. Use PowerSignage CMS to upload, schedule and display PowerPoint digital signage presentations on TV. First, create your presentation with PowerPoint. You can combine text, fonts, pictures, animation and HD video with PowerPoint’s drag-and-drop screen layout. Use PowerPoint to create kiosks, menu boards and stunning multimedia digital signage presentations. Next, upload your presentation to our PowerSignage CMS. You can assign the presentation to one or more of your TV screens. You have the choice to display signage continuously (24 x 7) or schedule by date, time and day-of-week. Last, plug PowerPlayer into your TV’s HDMI source input. It automatically downloads the PowerPoint digital signage presentation from the CMS and displays it on your TV. Our PowerPoint TV player is a plug-and-display digital signage solution. We make it very easy to display kiosks, menu boards and digital signage on your TV using just PowerPoint. All you need is Wifi. 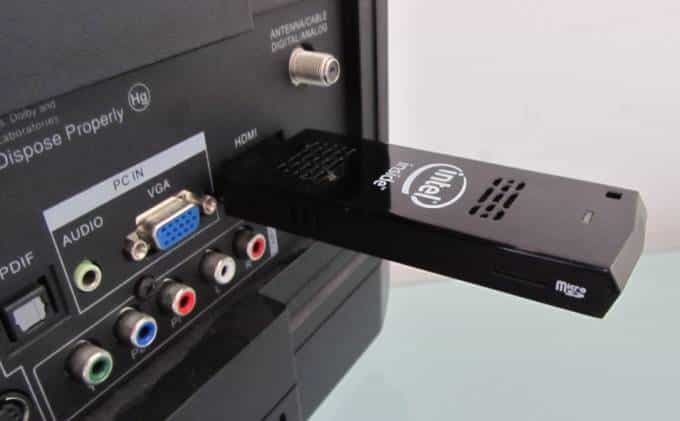 Our PowerPoint TV stick player is plug-and-display ready. 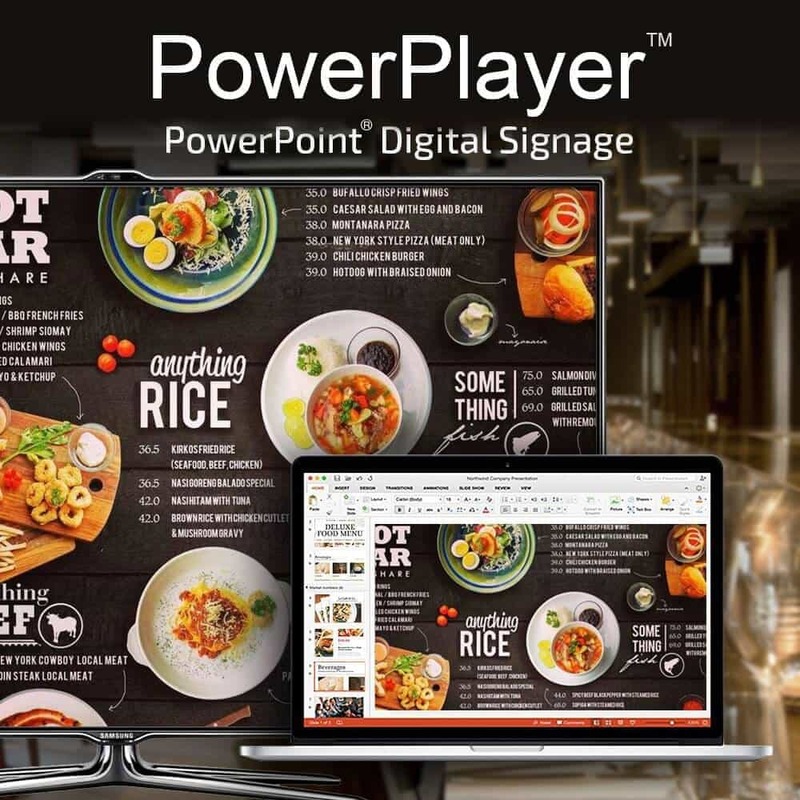 PowerPlayer is a complete PowerPoint digital signage solution that includes PC stick player hardware, software and cloud-based content management–everything needed to display PowerPoint on TV. So, you’re not a graphic designer? No problem. Use free PowerPoint digital signage templates to create standout multimedia customer presentations. Another option is to hire a freelancer from a website like fiverr to get custom slides made for as little as $5. For more demanding designs use content creation software like Adobe Photoshop or Illustrator. It’s easy to import these image files into your presentation. Or video files from editing tools like Adobe Premier to create professional video infomercials. PowerPoint’s digital signage templates, ease of use and broad multimedia support make it a fantastic content creation tool. PowerSignage CMS offers advanced PowerPoint digital signage solutions that make it easy to manage remote signage TV points at multiple locations. To display PowerPoint simply plug PowerPlayer into TV’s HDMI. We supply a HDMI extension cable for easy PowerPlayer plugin. PowerPlayer is an innovative media player that displays multimedia digital signage presentations on your TV with PowerPoint. It’s an ideal digital signage solution for health care, food chains, retail outlets, hotels and schools–any business with walk-in customers. Send us an email to learn about the benefits of using PowerPoint digital signage advertising in your business.